Weren't we just celebrating new year and making resolutions? How time flies! Can't believe that one and half month of 2013 is over! But enough about that. Today, it's all about L-O-V-E. Something I know most of you can relate to. Yiheee..
And boy do guys don't mind the frivolities on Heart's Day. They kinda use this to make up for every missed monthsary, birthday or times they should have been sweet to you. Am I right? Or am I right? So get ready to be a princess, it is your day! And to help you out, here's a simple FOTD that's great to take from Day to Night. It's still simple, nothing smokey. We want to look great, not different. And since you might want to reward him with a kiss or two, a sweet lip color is great. You definitely don't want him wiping off red lipstick after kissing you. That's a bit of a downer when you're trying to build up a romantic Valentine's evening. Being in love and having that perfect someone really adds that a certain spark to our eyes, a knowing smile to our lips and a little skip in our steps. Love, it becomes everything once you have it. Wow! I love your look here, Ms Shen. Beautiful as always! Lately I've been loving orange-y shades of eyeshadows. 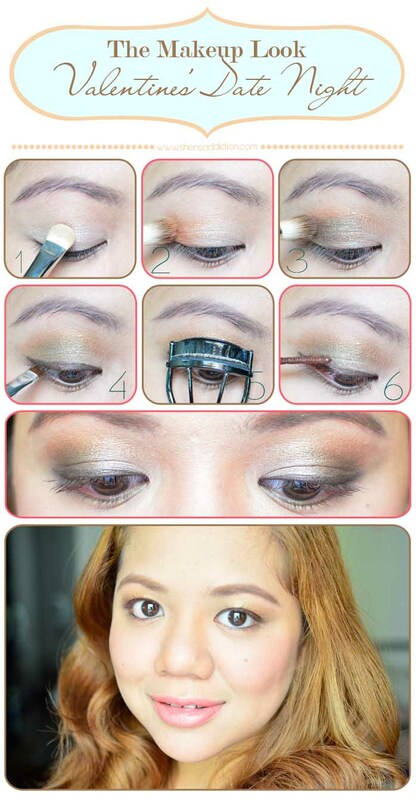 Maybe because of the Chacha tint I got from sampleroom :) The blending of the eyeshadow is great. You used BYS here diba? I'm intrigued with the brand line. I hope they can have branch here in Cebu too. Would def be replicating this look for Valentines Ms. Shen, Thanks for sharing! Lovely look. I love your hair color, too.